The European Union is freezing its work with the Ukrainian government on a controversial trade agreement, which the country decided to postpone last month triggering massive protests. Kiev said it has the will to continue talks. The EU believes that Ukraine’s position in the negotiations on the Association Agreement has “no grounds in reality”, tweeted EU enlargement chief Stefan Fuele. #Ukraine:Words & deeds of President &government regarding #AssocAgreement further&further apart.Their arguments have no grounds in reality. The angry remarks came after Fuele’s meeting with Ukrainian Deputy Prime Minister Sergey Arbuzov. Commenting on the news, the Ukrainian PM’s office said Kiev has a strong intention to continue negotiations with the EU. But Kiev will only respond to official messages from the Europeans, and not tweets, a spokesman for the Prime Minister added. 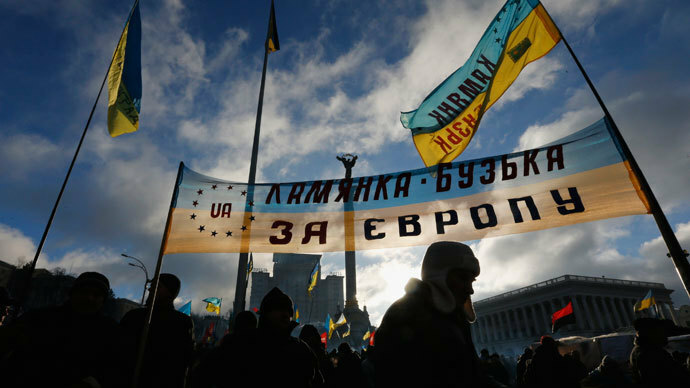 The EU and Ukraine resumed work on the agreement on Thursday this week after a pause. Ukrainian officials insist that the country is interested in signing it, but wants to do it on its own terms. The EU says it will not change the terms of the deal, but is prepared to ‘negotiate a roadmap’ on the deal’s implementation and assist Kiev in securing credit tranches from the International Monetary Fund. Following Fuele’s outburst, an EU source familiar with the stalled talks said Ukraine is being unreasonable in demanding financial compensation from the union. “We are essentially making a gift to Ukraine [by offering the free trade deal], so we cannot understand their talking about compensation,” the source told the Itar-Tass news agency. The trade deal, which was viewed by many Ukrainians as the first step for an eventual accession of their country into the European Union, was due to be signed earlier this month at a summit in Lithuania. But weeks before the meeting Kiev decided that it would suspend signing the deal. It cited concerns over the impact on the Ukrainian economy the move would have caused, and the lack of financial aid from Europe to cushion the blow. 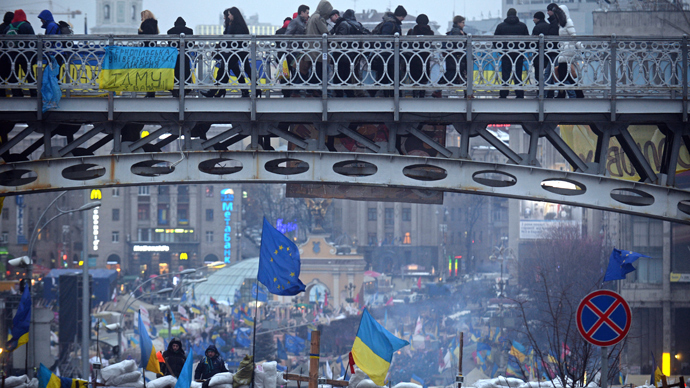 The decision announced in late November triggered massive protests in the Ukrainian capital and some other large cities. 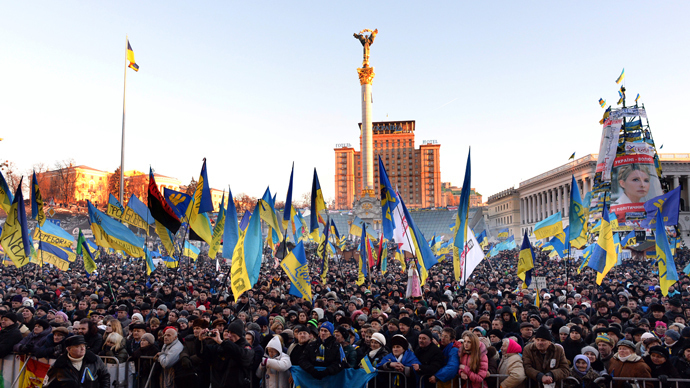 The protesters initially demanded that President Viktor Yanukovich overturn his decision. But as the EU summit passed without a trade deal for Ukraine, they turned their anger on the government and demanded its resignation. “I would have expected the EU to play softball with Yanukovich - by raising the stakes and acting as if they had him in their hands, they're actually only going to force the issue, which is that the EU didn't offer a deal. The EU offered a very dubious arrangement which would have opened the Ukraine to west industrial products, without the possibility of Ukrainian industry exporting to the East any longer,” said Srdja Trifkovic, Foreign Affairs Editor at Chronicles magazine. As the confrontation continues, European and American politicians and top officials are flocking to Ukraine to cheer up the opposition crowds and criticize the Yanukovich government for not following their demands. Russia, which was blamed by both the Ukrainian opposition and western statesmen for twisting Ukraine’s arms to stop its EU integration, is trying to distance itself from the conflict. But on several occasions it has criticized the West for what Moscow sees as blatant interference in Ukraine’s sovereign affairs. Moscow warned Ukraine against signing the trade agreement, saying that it would be forced to revoke its own free trade arrangement with the country to protect Russian markets from the inflow of European goods. This was branded as economic blackmail by some in the pro-EU integration ranks. Russia insists that it is only protecting its economic interests and in turn accuses the EU of covering their grudge from failing to reach their political and economic goals in Ukraine with pro-democracy rhetoric. But in fact foreign support of the Ukrainian opposition ignores the will of those Ukrainians who stand against the integration deal. “The EU doesn't exist as a coherent entity. We're looking at ‘Mitteleuropa’ – that’s the German term for Central Europe - which is Germany, Austria, Benelux, perhaps France. But certainly not the southern fringe of the EU. And they have had geopolitical interests in Ukraine all along,” Trifkovic told RT.